Search Results tab: You can enable or disable the check boxes next to each of the categories to display or hide each category in the Spotlight search menu and dialog. Click and drag the categories to the order that you prefer. For example, to see matching documents immediately after matching applications in the Spotlight dialog, drag Documents to the second position in the list. You can also specify a different keyboard shortcut for the Spotlight menu and window. 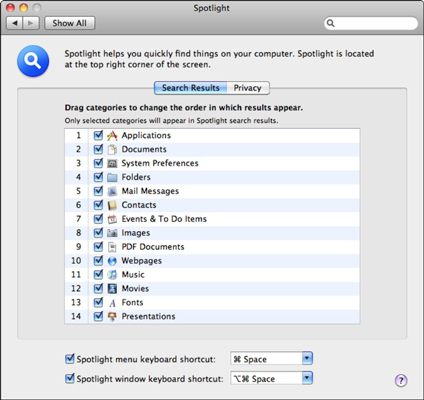 Privacy tab: If you don’t want to display the contents of certain folders in the Spotlight — for instance, if you work in a hospital setting and you can’t allow access to patient information and medical records — click the Add button (which carries a plus sign) and specify the folder or disk you want to exclude from Spotlight searches. Alternatively, just drag the folders or disks to exclude into the list from a Finder window. Fine-tune your Spotlight search results here.